In the move from Dash 7A to Dash 9, very few components have been carried over, and for the first time ever the South Korean maker now offers a short radius 14-tonner in the heavy equipment line-up, badged the Robex 145LCR-9. New from the ground up - save for the Mitsubishi four-cylinder engine taken from the conventional 14-tonner - the 145LCR-9 tips the scales at a hefty 16 tonnes, when kitted-out with an optional blade and 700mm triple grousers. In this configuration, the rear swing radius protrudes over the side of the tracks by 130mm, while taking the blade off the 145LCR-9 sees weight trimmed down to 15.2 tonnes. 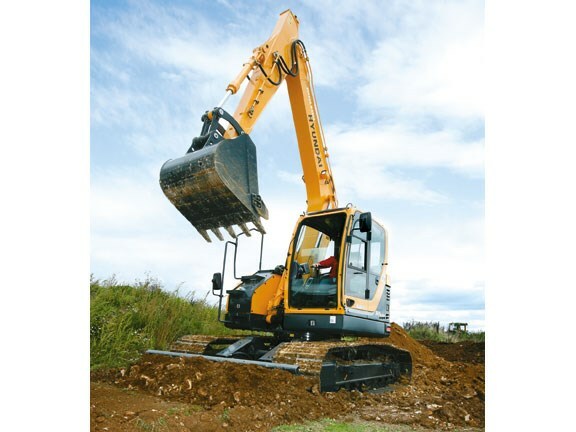 Digging equipment includes a one-piece 4.6m boom and 3.0m arm - a shorter, 2.5m arm is optional too - giving the 145LCR-9 a generous working envelope. This model comes on a crawler undercarriage measuring 3.82m long and 2.7m wide. Running gear affords seven bottom rollers and two top rollers, with a two-speed hydrostatic track drive giving travel speeds of 3.2km/h and 5.5km/h. 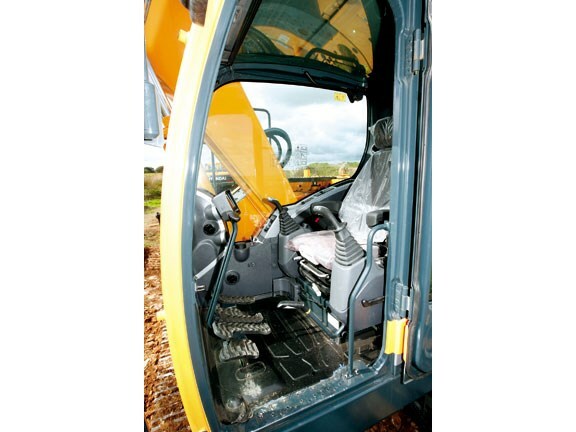 The generously proportioned cab features a one-piece right-hand window, a sophisticated 7-inch colour display for machine interpretation and adjustment, and a computer-aided power optimisation system that works behind the scenes to handle the relationship between engine and hydraulic pump. That engine is a Mitsubishi four-pot, which uses common rail electronic injection and a turbocharger to deliver 121hp at 2000rpm. Maximum torque is 444Nm, produced at 1700rpm. Two variable displacement piston pumps give a collective total of 260 litres of flow, while a gear pump is used for the pilot controls. 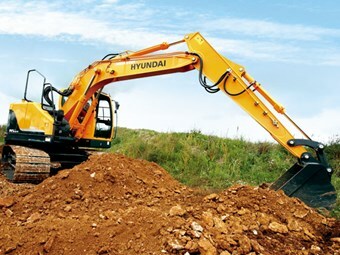 Hyundai has redesigned the hydraulic system to provide the operator with very fine levels of control. Even the spool valves give a much more precise level of flow with every function - each requiring much less effort to operate. Boom and arm flow regeneration is also included, along with the ability to tweak the speed relationship between the boom and arm on a scale of 1-10. The machine also offers automatic adjustment between boom and slew speeds too. In addition to the Power, Standard and Economy operating modes that are familiar on most models, the Dash 9 gets additional Work and User modes. Work mode enables the operator to choose between three work modes - digging, crushing and breaking - where flow settings can be tweaked through the 7-inch display, while the User mode can give operators the scope to make individual machine settings for their own preferences. 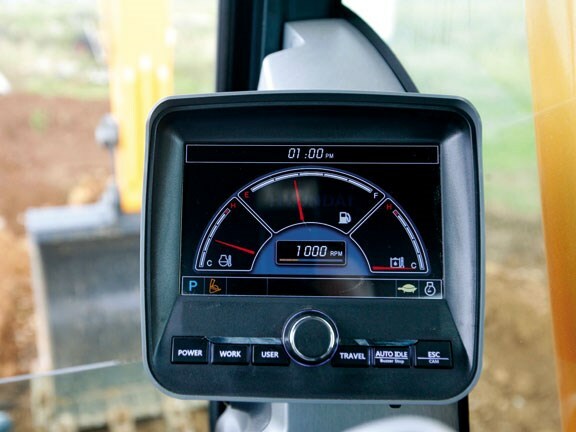 The default images on the in-cab monitor show coolant temperature, hydraulic oil temperature, fuel level and engine speed. A detailed service e-menu provides information on service intervals and service items, while a detailed monitoring function reveals individually recorded operating hours for time spent in each mode, plus time spent in low and high tracking speeds. Long-life hydraulic oil now offers 5000-hour oil change intervals (up from 2000 hours on Dash 7A models) with extended life hydraulic filters needing a swap every 1000 hours (previously 250 hour intervals). Wear-resistant polymer shims on pin joints reduce machine noise, while long-life bushings offer 250-hour greasing intervals on key components. Running costs are reduced through the use of a variable speed cooling fan, a two-stage auto deceleration system that first cuts engine speed back to 1000rpm after four seconds of inactivity, and settling at idle after 60 seconds of inactivity. Hyundai owners can also remotely monitor and track their machines using Hi-Mate GPS technology. An access panel behind the cab reveals the air filter, fuses, batteries, cooling package with removal fly screens and the engine's intercooler. On the right-hand rear corner, the door opens to reveal the hydraulic pump, diesel fuel filter and pilot filter. There is also a diesel transfer pump, with auto cut-off. The offside front corner of the machine plays host to the valve block, leaving space for a small windscreen washer bottle and two sight-tubes - one for hydraulic oil, the other for diesel fuel. Settling into the cab is impressive. There's plenty of space, good visibility to the right-hand side and plenty of legroom. You won't be disappointed with the storage space available. While the radio is behind me, its controls are on the right-hand console, below which is a touch panel for the climate control. There are plenty of vents both behind me and on the lower front corner - so keeping warm or cool shouldn't be a problem. The door's two upper window panes can be slid fore and aft, and locked in place, allowing fresh air in. Turning the ignition key puts life into the monitor, but the machine won't authorise an engine start if you're too quick. 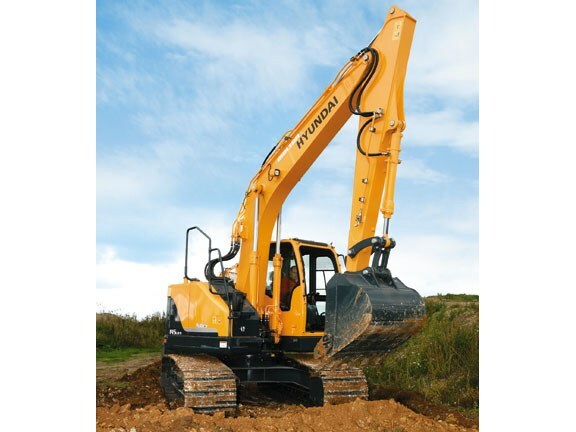 Only after it has carried out its own diagnostic checks, will the excavator's engine be allowed to start. The default mode setting is Economy, and a tug of the levers lifts engine rpm to the 1650rpm setting, putting the engine right into its peak torque zone, where it can deliver maximum efficiency. Thumbing the Power button on the colour display moves on to Standard and then Power modes, lifting the engine speed respectively to 1800rpm and 2000rpm. A further push of the button simply cycles back to the beginning of the modes, returning to the Economy setting. It operates smoothly and efficiently in Economy, with a touch of the Power Boost button giving some extra muscle on demand. There's an area of topsoil to strip before excavating, so I take full advantage of the blade and the 145LCR-9's 16-tonne operating weight. It doesn't disappoint - there's heaps of traction and a keen cut available from the blade, allowing material to curve forward and be carried across site. 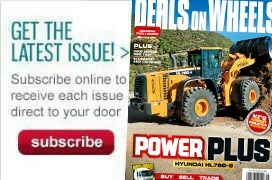 I'm frustrated by the two-speed tracking button being positioned on the right-hand console - it would be more convenient on the top of the blade's lift/lower lever, or on a tracking lever, to combine high speed reversing with low-speed high torque dozing. That said, it's an impressive and stable performer with the blade. There's no quick hitch fitted to this model, though there's so much surefootedness from the 3.85m long undercarriage that I doubt it'll do much to unsettle the balance of this excavator. It doesn't suffer the characteristic nodding, despite having a 3m arm, but then again, it's probably one of the heaviest short-radius machines. The downsides? Apart from the long joysticks - which are a personal preference - and the Korean maker's drab livery and branding, there's little to fuss about when it comes to poking holes in the 145LCR-9.